Create a sleek and stunning appearance in any space by installing Tokio 15mm Roasted Espresso laminate flooring. This stunning laminate flooring style features a deep, dark brown color that looks nearly black but has a warmer undertone. This creates a stylish space that looks chic and elegant without being cold or uninviting. 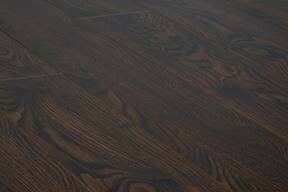 Tokio 15mm Roasted Espresso laminate flooring is noted for its high-wear rating of AC4, the top rating we carry. In addition, this durable flooring option comes with a lifetime warranty, making it a solid investment for homeowners. At 15mm thick, it's built to withstand the everyday wear and tear of life while also being easy to keep clean and maintain over the years. Choose this stylish laminate flooring to give your home a fresh, modern update. At iDeal Floors, you'll find great prices on high-quality flooring products like laminate, vinyl, tile, carpet, hardwood and more. If you have any questions about Tokio 15mm Roasted Espresso laminate flooring or other products on our site, simply contact our friendly team of flooring experts to learn more.